How is Romney-Obama like Reagan-Carter? 2012 is no 1980, and Mitt Romney is no Ronald Reagan. At least that's the message coming from many Republicans to their party's presidential candidate. Politico reports that comparisons to the 1980 race - when President Jimmy Carter lost to Reagan in a landslide - just don't hold up. One Reagan biographer calls the comparison a "stretch" and says Romney needs to do a lot more at this point to win than Reagan did. For starters, President Barack Obama remains personally popular among Americans despite a grim economy. Obama's approval is at around 50%, compared with 37% for Carter at this point in 1980. Although Reagan trailed Carter in some polls - kind of like Romney - his unfavorable ratings weren't increasing. Romney just isn't connecting with voters like Reagan did. What's more, Reagan was the overwhelming favorite of the Republican base; compare that to Romney: Many conservatives have never warmed up to him. Another big difference between 1980 and today is the electoral map. Reagan ultimately carried one in four Democrats in that election. It's hard to imagine Romney ever pulling that off in today's highly polarized electorate. Also, 32 years ago there were gas shortages and double-digit inflation and double-digit interest rates - or stagflation. Nonetheless, one top Romney adviser says the 1980 race shows there's no need to panic if Romney is down in the polls at this point. Plus it's not the first time Obama - a weakened, liberal incumbent with a troubled economy and problems in the Middle East - has been compared to Carter. Here’s my question to you: How is Romney-Obama like Reagan-Carter? Um, not anything at all. Romney is no Reagan. Whether you agreed with Reagan or not, when he took a stand he stuck to it. Romney has been all over the place on every issue. People compare Obama to Carter because they say he is weak on foreign policy but the comparisons don't hold water. How can you compare a rescue mission that failed to a secret hit mission that succeeded? The parallels between this election and 1980 are uncanny. We have a bad economy with high unemployment just like 1980. Our respect around the world has diminished greatly in particular in the Mideast. We have a president who preaches redistribution of wealth. Carter agreed with the same type of system. Romney like Reagan is preaching more self-reliance and less dependency on government. This election is nothing like Reagan-Carter. During that election, we had the problems of the oil embargo compounded with the Iran hostage crisis. Reagan was well-liked. No one likes Romney, not even his Republican backers. Reagan had finesse and showmanship and Romney doesn’t. There is no similarity whatsoever. Romney-Obama is like paying big money for a Broadway show and then finding out that the understudies are going to perform instead. Carter and Obama are so similar, Jack. We have a miserable depression, a totally failed foreign policy, a total lack of leadership and a failed presidency of someone so incompetent that you can't believe he ever got elected. Romney will be the Reagan of 2012 and win in spite of all these phony polls put out by the corrupt media. It's not. Comparing Mitt Romney to President Reagan is like comparing Junior Samples, of "Hee Haw" fame, to Stephen Hawkings. It's true both President Carter and President Obama had to deal with a hostage situation. President Carter had to deal with the Iranian hostage situation whereas President Obama is the hostage. He is the hostage of the House of Representatives. Since the first day of his presidency they have stated clearly that were going to do whatever they could to ensure his failure. Simply put you have a true American – Patriot conservative who believes in free enterprise against a totally inexperienced liberal who has ZERO knowledge or interest in free enterprise, hates the military and trully believes that BIG GOVERNMENT with the ability to print "Monopoly Money" is the answer. They both take orders from the bilderberg group in order to create a one world government controlled by corporations and the rich? No, Scratch that; I'll give the corporate media line. This is an election between two polar opposites fighting to take America forward with liberal policies or conservative policies. It is a defining moment (along with the hundreds of other defining moments) that will change the country forever. There, fixed it. Some of the things Romney is saying are reminiscent of the speeches by Ronald Reagan. Regan claimed that America was safer because of a strong military and that tyrants are tempted when they are weak. I disagree with Romney's and the late Ronald Reagan's theory though. On 9-11 America was the strongest military on the planet yet we were attacked. The United States spends more on it's military then any 10 countries combined. On September 11, 2001 America was brought to its knees by several men and a few box cutters. 2 wars and 11 years later America is broke. How is that strong military working out for you Mr. Romney. Romney has a tin ear as did Carter. While he looks presidential like Reagan, he cannot connect with people which was Carter's weak point. (I wouldn't be surprised to hear Romney report that he was attacked by a rabid rabbit.) Obama is a professional; Romney an amateur. Were still in the Arab WOrld while the state dept lies to american people about who our friends are and OiLGas Consumption Malfunction m.p.g. autos are saturating our country as water supply is destroyed and foreign oil is inside our country dictating energy policy.That and the economy is based on welfare payments to prop up the housing market as the rest of us suffer not even having a place to call our own. The same pattern exists. Republicans leave a weak economy then use the current Democrat as the blame so they can screw Americans again. The sad part is it really works. You see Both Bush Presidents screwed us and here go again with Romney for the follow up. The only thing Romney has in common with Reagan is great hair. I truly believed that both Reagan & Carter as Presidents had the best interest of all Americans at heart. Romney sadly does not & will not if elected. This election is nothing like Reagan Carter. During that election, we had the problems of the oil embargo compounded with the Iran Hostage Crisis, Wherein Reagan-Bush secretly negotiated with the Iranians to continue holding the hostages until after the election was over in exchange for giving them Weapons of Mass Destruction. The Iranians agreed and once elected, the hostages were freed and Reagan supplied Iran with WMDs. It was treason, but never prosecuted as such because it took years to uncover the truth and by then, Reagan was in seriously declining health. His claims that he cold not recall what happened likely were true. Reagan was well liked. If Romney tried to pull a similar stunt he would go to jail because frankly, no one likes Romney, not even his Republican backers. The again, Reagan had finesse and showmanship and Romney is a bungling idiot. It's not. That's what the GOP want everyone to think. Jack, are you buying into the GOP Playbook that says if you say something false enough time, that makes it true? Um, not anything at all. Romney is no Reagan. Whether you agreed with Reagan or not, when he took a stand he stuck to it. Romney has been all over the place on every issue. People compare Obama to Carter because they say he is weak on foreign policy but the comparisons don't hold water. How can you compare a rescue mission that failed to a secret hit mission that succeeded? Obama has not bent to Israel's constant demands for action and he's sided with the people to bring down Mubarak and Kadaffi, even when every president in our history up to that time has towed the line. Reagan "The De-Regulator, The Trickle Down, The Worst President Ever" couldn't hold a candle to Carter. Carter, was and still is a very decent man. Who at least tried to make the world and the USA a better place. Reagan and his pirates wanted and did make the Rich richer. And helped drive more of the middle-class into the dirt. Reagan was no good!! Romney.......well he's another Reagan. He only looks out for his rich friends. A Reagan, like a Romney presidency we would see the rest of our Jobs driven out of this country, higher gas, food and housing (rental) costs. He will be bad for those who are young and still scratching out an existence. Obama.......he's the man. Don't believe me. Ask Wall st...was at 600 in 2008. Now it's at 13,000 and climbing in 2012. Or, go ask Osama! All he needs is a congress that represents 100% of the American people not the 2%!! I'm not happy with the wars or outsourcing. But, the alternative???? It's not. Comparing Mitt Romney to President Reagan is like comparing Junior Samples, of "Hee Haw" fame to Stephen Hawkings of "A Brief History of Time" fame. Actually, thats unfair to Junior Samples, even he knew you have to pay for the Ambulance in Hooterville. Well lets see, Romney is a Republican like Reagan , he is running for President like Reagan, come on Jack you know those are the only similarities. Mitt Romney won't even grow up to be Ronald Regan. Obama/ Carter again Jack not even close. This will not be a landslide either . The only thing I can come up with is that Reagan and Romney's last names begin with R. Oh yes! Reagan had Alzheimer's so I guess that means Romney does as well. Just half and half. This time the incumbent does have a terrible economy with which he has done little good, but is both likable and makes the prettier speeches. He also has notable successes to go with his missteps overseas. The challenger has great points on foreign policy and the economy as well as the sustainability of our entitlements, but is not as good a communicator and his message of less government support scares many. That is why this election may go either way. After his first term, even his Democratic colleagues thought little of Carter. Back then Jimmy Carter appeared like a deer caught in the headlights of an on-coming truck while Reagan came across as the guy driving the truck. Today, Obama and Romney are both caught in the headlights and are equally clueless so there's really no legitimate comparison to be made. The parallels between this election and 1980 are uncanny. We have a bad economy with high unemployment just like 1980. Our respect around the world has diminished greatly in particular the Mid East because of this strategy of appeasement to Islamic countries making America look weak. We have a President that preaches redistribution of wealth. Carter agreed with the same type of system. Obama's failed economic policies like Carter's even worse have placed more Americans on food stamps or some or type of gov't assistance. Romney like Reagan is preaching more self reliance and less dependency on government and to get big government off the backs of small business forcing the entrapenurial spirit to rise. Carter and Obama are so similar, Jack. We have a miserable depression, a totally failed foreign policy, a total lack of leadership and a failed Presidency of someone so incompetent that you can't believe he ever got elected. Romney will be the Reagan of 2012 and win in spite of all these phony polls put out by the corrupt media. Carter and Obama have been a 'malaise' (to use Carter's word!) on America and like Reagan, Romney's election will finally be "the end of an ERROR"!!! Ah, the Reagan myth. One can argue that Obama actually did a better job with first term unemployment. A lot of people don't take into consideration that taxes are already at a record low, so it doesn't leave him with very many tools in his tool box to do anything except spend. Which Reagan actually increased federal spending by 3% over Carter. I'm really disappointed in you, CNN, for thinking that the public would by into the mythical creation: Reagan. Jack: Iran is the similarity between Reagan-Carter and Romney-Bush. All four men had to deal with an Iran who did or was about to step over the line. Israel is on edge, but then Israel has been on edge since 1948. For the last 3500 to 4500 years the Middle East has always been in turmoil. Reagan tried to do something about the Middle East in Lebanon. Jimmy Carter did have success with Egypt and Israel, but Iran exploded. Carter had to deal with 444 days of being held hostage. President Obama has budding democracy all over the Middle East and North Africa. Democracy is like a hot potato, if you have never seen a potato. I dunno... Romney keeps making stupid mistakes that will cost him the election, like Carter, when he should have been a shoo-in? You tell me. Only the lazy see an easy comparison. For all of Reagan's lack of intellectual depth, which seems to match Romney, Reagan had a clearer vision of what his party should stand for and how it helped the American people. Romney's vision seem glib and superficial, more aimed at protecting his wealth and that of his friends than for the benefit of the American people. While both Carter and Obama have presided over an economy in tatters as well as conflicts in the Middle East, Carter was a poor politician taking advantage of a Republican Party suffering from Nixon's downfall, while Obama seems to be Reagan's equal as the Great Communicator, appearing equally teflon-coated, if only from the lack of questioning done on Obama's efforts in the Middle East and Afghanistan, which have been ineffectual at best, as well as his mishandling of the economy. How is Romney-Obama like Reagan-Carter? The continued failure of the press to provide in depth coverage of their favored candidates failings to the same extent that they've look at his successes. Both are Republicans and Democrats, and independents need not apply. There is no similarity whatsoever. Romney-Obama is like paying big money for a Broadway show and then finding out that the stand-ins are going to perform instead. I believe it is the political parties. In 1980 the Democratic Party was in a battle for "the heart and soul". A battle that Jimmy Carter won in the short run, but lost in the long run. The Republican Party is in a battle for control of their party by the Plutocrats and extremists on one side and the more traditional Republicans on the other. The Plutocrats have won in the short term. I suspect the long term as well. other than the economy being in recession, I really don't see that many parallels. Reagan was a charismatic speaker while Romney tends to alienate people every time he opens his mouth. Carter had a failed attempt to rescue the Iran hostages while Obama eliminated bin Laden and helped free the Libyans from Gaddafi without an invasion. Reagan came across as FOR working people and even union people (the "Reagan Democrates") supported him. Romney comes across as an entitled "Richie Rich" inheritance baby that could care less about anyone that isn't a multi-millionaire like himself. You know, Jack, it used to be when Reagan gave a speech my now deceased husband and I would sit there and laugh – he looked like a clown. Of course we felt bad after discovering he had Alzheimer's years later. There was a reason for coming off not knowing what he was doing. Mitt The Twitt has no excuse. And why does a man who holds half of us in contempt and doesn't want to pay US taxes want to be our president? Does he think it's his damn birthright? One up his Daddy? What gives with this creep? It isn't! Different times, different enemies, different economies! Different debt and a completely un compromising GOP House who will not sign anything that does not include the Tax Break for the rich! The GOP in Congress has grown cold and refuse to change their ways due to greed and power lust. The future will see that as the Beginning of the End of the GOP as it divides within. You simply cannot compare times in history, Jack! You know what is funny is the Democrat Presidents go out and do good work even after their Terms in Office. Carter, Clinton, both doing good works and helping the world! Both Bush's....nothing unless you bout when Clinton dragged Papa Bush along! Democrat Presidents are all about helping people while Republican Presidents are all about the MONEY only! Carter was a looser just like Obama. Mid East countries portrayed Carter as weak, took a long time to make a decision just like Obama. The econmomy was in shambles under Carter just like it is tody under Obama. Reagen had a hard time convincing voters thst he could fix the economy just like Romney today. Reagan was behind the polls but won the election, could be similar today with Romney. But not so fast. The difference today is that we have a lot more clueless people today than we had back then. Also the Liberal Press has greater numbers that lie a lot in favor for Obama. So that means Obama will probably win but those that voted for him will disawow that they voted for him in 2014. Same theing happenned in 2010, you couldn't find very many people that stated they voted for Obama in 2008. People have short memories, those that hated Obama in 2010 will vote for Obama in 2012. This is the hard truth, what can you say. Some people get brainwashed very easy. It is similar only in that if the Republican gets elected, it will mean a final crushing blow to what used to be the middle class and America. Reagan started it and Romney could finish it, for the triumph of aristocracy over democracy. Otherwise, not much. Reagan seemed to believe what he was saying, and was personable. Romney seems to believe in nothing, as long as it serves his self-interest, and is so fake, even low information voters get it. Presidents Obama and Reagan were both good communicators with great charisma and didn't get into the policy weeds. Governor Romney and President Carter are both unable to connect to the average person and make everything too complicated. So Obama is like Reagan and Romney is like Carter when it comes to communicating with the electorate. If you know who's turn it is, and what bunch you are with, then you should know the answer to this question. In the 1970's the Federal Government & the States all imposed hiring freezes, and began laying off people do to attrition. The same has happened since Obama took office. After Reagan took office, the 50 year old's who were in their 20's in 1981 began entering the workforce. This is when the hiring freezes were lifted and the government and private sector began hiring. This should happen again when the grand kids of the 50 year old's begin entering the workforce in a few more years. This is where the jobs that Reagan got credit for came from, not from his economic policies that many people believe, or as they say in Chicago, if you don't like the weather in Chicago, wait 10 minutes and it will change. We live in an intelligent society. I'm not sure they are the same. Reagan, like Romney, talks tough yet both avoid military service. Carter served and Obama got bin Laden. When you get right down to it Reagan talked tough...but showed his stuff against Granada. Whew, that was a close one. Cater fumbled and Obama got the worst guy in the world. I am going to have to wait and see where you are going with this question. I can't think of anything interesting to add. It's Jimmy Carteritis, I think. Doug. Pepperell, MA. No comparison; Carter cares deeply about ALL people and especially Americans; Reagan was in the right place at the right time and could sell most anything; President Obama cares deeply about all people and believes in opportunities for all and fairness; Romney cares about some Americans, espeically the rich but will say anything to get a vote, but he can't sell it. Reagan played bonzo going to college; Carter had a brother who made beer; Obama has his own beer and Romney plays with an etch-a-sketch. 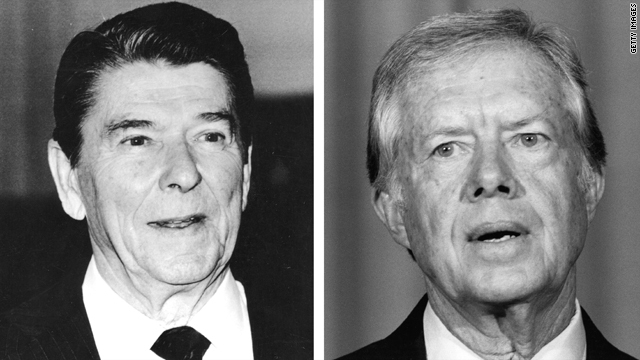 Any comparison to the Reagan – Carter campaigns is, at best, an unrealistic exercise. I believe we are a much better informed populace, or at least we have a healthier skepticisim about politicians. The speed that information travels now, the constant presence of cell phone cameras and the internet, has given the public the tools it didn't have in those innocent days that Republicans long for. Neither Reagan or Carter had to deal with being caught on tape declaring outright disgust for half the country. Neither one of them was of mixed race, or were hiding massive fortunes in off-shore accounts. Its only the same in Republcian wishful thinking. They always have nostalgia about their Presidents and major criticisms of Democratic Presidents. I bet, if you really do the research of Carter's presidency, he was not a bad president at all and surely 10 x's better than George Bush who republicans still try to praise.....All Republicans have is Self-fullfilling Prophecies,,,,especially with Economy, if they say their rich buddies, businesses won't invest, then maybe they will hear and not invest. They have been the only ones holding back the economy...preventing as much as possible help for America. These are different times with its own sets of problems, so we can't make a fair comparison. President Obama rescued us from another great depression. Where we were when he took office losing eight hundred jobs a month, we now are creating jobs every month. He got rid of the mass murderer Osama bin Laden. He saved our manufacturing base, the auto industry is now alive and thriving. If people will vote out this unpopular tea party Congress who obstruct everything, and elect those who would actually vote for the American jobs act and stop laying off teachers, firefighters and police we would have a lot more jobs. Jimmy Carter was our most religious President. He was also the most truthful which hurt him. He did bring home the hostages alive. He also brought some peace to the Mid East. I don't know much about Mitt Romney, he is so secretive, secret church, secret tax returns. He also has changed his whole persona, his beliefs which changed drastically from his run for Governor to his run for President. It does seem that his major goal in life to create as much wealth for himself as possible. I don't see much resemblance to Reagan. How is Romney-Obama like Reagan-Carter ? Believe me, and I am sure you and a lot of people would agree with me on this : I would rather WAIT IN LINE FOR GAS, and have the "Surplus" like we had when Clinton left office, Than To Have a 16 TRILLION Dollar Debt, and be in hawk forever !! Jack: There is no comparison between the 1980 election & this presidential election. Riomney is not in Reagan's class. President Obama is not a weakened incumbent as Carter was. A good man who was a victim of circumstances like the hostage of Americans in Iran, high gas prices, and a flailing economy. None of these three men were "mean spirited". Romney is. He Offers no solutions other than getting rid of the President. If the voter suppression is not stopped, it could mean that a non-qualified man could sit in the Oval office. But we must always remember that this fool of a man is white! That is the whole enchilada! This is what is motivating the GOP. What a shame! 1. Reagan was well like without hidden agenda, for which, Romney is a self-made mistake all the time. 2. Reagan has the best interest of the nation at hear, which Romney has zero....he custom-made himself running for the rich only. 4. Hey, Obama is doing his best and has the biggest accomplishments under the circumstances handed to him from Bush administration which Romney can't have a kind word about. 6. Romney knows nothing of the dynamic of foreign affairs....he is too stupid to learn anything in this department. One thing to note: Reagan was an actor and therefore had the skills to show charisma, while Romney apparently lacks such skills. The Republican party is now divided, so really nobody would be able to get the full support, even if that would be another Reagan. Romney is even worse for the country than St. Ronald and not nearly as good at pulling the wool over the voter’s eyes. Carter is and was more honest than Obama, but was not nearly as lucky as Obama. Not much, Jack. While it's true that President Obama may not have been able to salvage the economy as he had hoped, the fact that he remains popular with the people just might earn him a second chance to finish what he started. Unfortunately, I don't think I can say the same for Romney. He first has to repair his political campaign blunders before he even considers fixing the economy or any other problems. Not very much. Reagen was a great communicator and in a contest Romney will probably lose to Obama. On foreign policy Carter went through a difficult period with the Iran hostage crisis and at this point it's the Republican candidate who left a bad impression with his reaction to the violence in the Middle East. So it's very hard to compare these candidates. With the economy in the current situation the Republicans would have had a good chance of winning, but at this point the conclusion has to be that they simply don't have the candidate to win this race. There is no comparison Jack. First of Ronald Reagan was a movie start and Romney isn't. Reagan had support from the American people and Romney doesn't. The last time republicans were in charge of the Whitehouse we engaged in a war over WMD's in Iraq that were non existent. America is not in a hurry to make that mistake again. It's a continuation of Americas epic struggle of evil vs. the lesser evil; But since we really can't tell anymore which is which I think we may have won. Welllll, now, the races are not at all similar; for one thing Reagan had a functioning brain at the time. Also, The Great Communicator was also a great Compromiser, good at working w/Democrats & Republicans alike. Reagan also paid his fair share of taxes. Jack, President Obama is the better communicator like Reagan was and Romney just blows in the wind like Carter did – reactionary instead of action oriented. There is no comparisons to 1980 debates RR was good debater JC was not, Obama is strong, Romney, we will all be waiting for him to put his foot in his mouth! Other then it's a Democrat against a Republican, there are no similarities unless being the direct opposite is the comparison. Other then the brainwashed FOX crowd, most Americans see Obama is trying and slowly succeeding in bringing back the economy, despite the GOP obstructionism in Congress. I think there will be a landslide, but it won't be for Romney. No comparison. For one thing, Romney will never be able to stand up to a nuclear Iran like Reagan stood up to the Soviets. Another thing, Obama didn't have a hostage situation like Carter did, and has ended a war which Carter never had to deal with. Bottom line: This is 2012...not 1980. The difference between Romney and Reagan is that Reagan actually did care about the middle class. While Reagan's policies sowed the seeds for the long-term decline of the middle class over the past thirty years, there was a heart and soul in there somewhere. Romney seems indifferent to those who don't belong to the country club. There is no comparison between these two elections, none what so ever. Anybody trying to compare this Obama-Romney election to Carter-Reagan which happened over 30 years ago, is trying desperately to make a 3 piece silk suit out of a sows ear with socks to match. Actually you have it reversed reagan was nothing but a good talker like obama, and carter was a decent rich man who didn't know how to stand in front of a podium and lie about everything to make himself look good. No two people are alike but... My only remembrance/knowledge about the men of the two parties is this. Reagan and Romney were both governors before becoming president. Reagan left his governorship with a 35% approval rating and Romney left with a 39% approval rating. Carter and Obama both have a Noble Peace award. Which do I feel more comfortable with. Talking tough and dramatic can get you in a lot of hot water leading to war. Both Carter and Obama made hard decisions to free our nation of terrorist but did it with out losing thousands up on thousands. I'm one of those people who cares what image my country reflects. I would rather see a "Peace building" country than a country to be feared. I didn't realize that 1980 was so long ago that all the photos were black and white. Used to be a fan of your no-nonsense take on politics, Jack, but now I'm seeing some partisan seepage that isn't very pretty. Comparing Mitt Romney to Ronald Reagan and President Obama to Jimmy Carter is simple-minded and inaccurate. Mitt Romney is no Ronald Reagan. In fact, there isn't a Republican on Earth today who is even remotely like Reagan. Reagan is far to liberal for today's GOP. Jimmy Carter's presidency gets a bad rap because of the hostage crisis and inflation. Furthermore, Carter didn't come into office facing two wars, a collapse of the banking system, and the loss of +800,000 job every month. The comparison your article proposes is clearly slanted - in the wrong direction. the single most influential factor of "the rich get richer, the poor get poorer, at the expense of the dwindling middle class"
of the past 30 years. Even the most devout of the GOP have to admit that Mitt Romney is no Ronald Reagan. The similarity is in that both CARTER and OBAMA are anit-semites! Neither Reagan nor Romney is that way! Stupid idealogy/question. Romney is no Reagan and Obam is no Carter. Why would you equate these. There's no comparison. With Reagan v. Carter there were two gentlemen who had America's interests at heart. Now you have one gentleman with the same interests as past presidents, and one CEO with foot-in-mouth disease who's trying to put another feather in his top hat. Let's see here. 1980: economy completely in the tank, hostages in Iran, gas lines, massively popular and transformational Republican candidate. 2012: economy recovering, Bin Laden dead, president's approval rating still around 50%, worst Republican candidate in over a decade. Need I say more? Two of them have Nobel Peace awards. The other two have altzymers or at least one did and the other has it now. In 1980 and 2012, the incumbent pleaded for 4 more years to address problems that should have been top priority in the first 4 years. Today, like 1980, the contrived situation is that the challenger is trailing the incumbent. Today, like 1980, my gut tells me that Americans have had enough of the incumbent and are going to vote him out. I was right in 1980, and everything feels the same today as it did then. You can replace interest rates, oil concerns & stagflation with ridiculously high unemployment and crushing government debt. Barack Obama is Carter 2.0. The Reagan/Carter comparison is worthless, because the election has a completely different dynamic this time around. There is no strong third party candidate in this election to redistribute votes. People still remember that the economy was cratered by conservative economic policy. When Reagan proposed his form of economic policy, it hadn't been implemented in the US since before the Great Depression, so people were willing to give it a try. Now many of us know better. The majority of voters willing to support Romney are either selfish, greedy, misguided, racist or ignorant. They can decide which category they fall into. romney is the clear choice if we dont stand with israel we are toast! I think we may be looking at an Obama landslide, if Romney keeps talking. Romney is doing way too much acting! How is Romney-Obama like Reagan-Carter? Every bit as much as a fish is like a bicycle. Republicans love to make the Obama-Carter correlation, just as they take every opportunity to pronounce his full name with a heavy accent on the HUSSEIN. It's just political posturing and rhetoric. Next. Very similar: two Nobel Peace Prize winners versus two failed trickle-down theorists. Neither CARTER nor OBAMA has enough sense to DO IRAN when they could do them! Iran will be the downfall of the world due to 2 stupid nudniks that neither had sense to enough to obliterate this counrry!!! Jack, You are way out this time.Romney is at best a complete joke .Has given new meany to the flip-flop and is nothing more than Bush on steroids.I realize you will never give Obama credit for anything . Had the Repugs worked with him as they should have, we would all be better off.As far as I'm concerned Reagan was not that great and many of the problems we have today can be traced back to him and his trickle down economics. More like Romney=Goliath and Obama=David, and we all know what happened to Goliath. Obama is going to slay Romney. You calling Obama a liberal doesn't mean he is one, Jack. He isn't, more's the pity. Not at all like the former. I met Carter when he was running back in 76 and was convinced that he was a snake oil salesman, but appeared to be a better choice than Ford. By 1980, Carter had lost me for a multitude of reasons. I do not see that same problem with President Obama. For all that the Republicans claim he is against business being successful, would someone please explain why the Dow, the NASDAQ and the S&P 500 are all at least 50% higher in value than it was before? President Obama has overseen the rescue of Detroit, the ending of our involvement in Iraq, the death of OBL, and a remarkable recovery given the cards he was dealt, and how the Republicans keep trying to change the rules in the middle of the game. Mitt Romney, on the other hand, has proven that he believes that he should be President because it is his Destiny to be so. Not because he believes in the American People and what we CAN be, but because he thinks he is entitled to it. And that is how he carries himself, too. Today are different times with worse situations and neither Obama nor Romney should be compared to Reagan or Carter but evaluated on their own differences, similarities, character, background, values, and work performance. Good campaign strategy get people talking about how Romney is no Reagan. With the amount of US dollars Israel has taken over the years it is as if they are part of Romney's 47%. I strongly feel that your Neocomm trying to influence our internal elections will come back to bite you. Four years ago Obama was not really known and the younger generation, the college kids were all in love with him. Those same kids are now 4 years older, many of them without jobs. While not in love with Romney, many will simply vote against Obama. This is similar to 1980 when people voted against Carter. Remember, Reagan's popularity grew while he was president. Republicans need to stop comparisons to Reagan years it was a different era and a changed electoral demographic is in place now. at the other end Democrats need to stop comparisons of the past. Changes in the way we do business, get our news, Social media change all of the past, And a changing electorate. Obama had a Congress controlled by the Democrats for the first part of his term. That is how he got Obamacare approved. To say that the Repulicans were determined to make him fail DOESN'T account for the Democrats losing their majority in the Congress and almost losing the Senate. Obama has "led from behind" and blaming Bush for too long. Reagan never blamed Carter for the terrible mess he inherited when he became President. Time for Obama to keep his promise..."if I can't get this done in 1 term; then I will be a 1 term President." Like President Carter, Obama beleives "We must adjust to changing times and still hold to unchanging principles." and Like President Reagan Romney is an Actor. Jack, what percentage of this year's voters were even able to vote in the Carter/Reagan election? I was in 3rd grade then, I am 40 years old with a 3rd grader of my own now. Will they still be talking about the Obama/Romney election when my 3rd grader is 40? Doubt it, let's move on. Romney is Reagan without the approval. It’s the wife’s dummy, Ann Romney is just like Nancy Reagan-both control freaks; Michele Obama is just like Roslyn Carter-both sugar and spice. How are they the same? Beats me. The differences? Night and day on both sides. Reagan truly was the great communicator and Romney clearly is not. Obama makes Carter look like a foreign policy and economic genius. President Reagan was no Reagan either. “The presidency of Ronald Reagan was marked by multiple scandals, resulting in the investigation, indictment, or conviction of over 138 administration officials, the largest number for any US president." The two races don't compare. Reagan had a coherent political philosophy and great ability to communicate with ordinary people. Romney is both inarticulate and incoherent. There's no real comparison. For one thing, as a former actor Reagan was far more comfortable and effective at public speaking. Every time Romney opens his mouth he jumps in with both feet. Reagan appealed to Independants and moderates; Romney almost seems to be working at pushing them away. Reagan stood his ground, Romney . . . well, you get the idea. It's not, Jack. Reagan was eloquent. Mitt, not so much. Carter was weak. Obama, not so much. Don't compare the two elections – it's like comparing apples to sawdust. Reagan sold weapons (including nerve gas) to Saddam Hussein to fight the Iran/Iraq War. He also sold weapons (including Stinger missiles) to Osama bin Laden to fight the Soviets. Yeah, sounds just like Romney. What an insipid article. My opinion is that all though some entertain that idea, I think President Obama is not President Carter and Gov. Romney is not President Reagan. Comparing Obama to Jimmy Carter is just another scare-tactic the Republicans are using on Americans. Romney thinks that if he can somehow juxtapose both Obama and Carter, it will make Americans nostalgic of the 1980's. The truth is, times and economic circumstances have changed, and this scare-tactics is not working. I was born in the 80's, How the hell would I know? Can we get over reagan-carter already it was 30 years ago. They are similar. Like Carter, Obama is in way over his head and is trying the lead from the rear. If Romney was more life Reagan, this election would be over. I voted for Carter and was a devout Democrat. He led us down the wrong road so I voted for Reagan. Obama is leading us down the wrong road as did Carter. Until the Democrats get off their high Liberal Attitude i'll never go back to being a Democrat. I don't like Romney but he has the right vision for the country bottom line. This election is nothing like 1980. If Obama had approval ratings in the 30-40% range and the Republicans had run a more charismatic candidate such as Herman Cain, John Huntsman, or a brick, we'd be talking about this comparison more seriously. Obama is not facing nearly the magnitude of the crisis Jimmy Carter faced in 1980. If anything, I would compare this to the 2004 election, where an incumbent president who wasn't terribly popular or had done terribly well won against a politician bred from the Massachusetts institutions who was accused of flip-flopping. Mitt Romney should be known as "Republican John Kerry". It isn’t. Reagan was the great communicator because when he couldn’t spin his hypocrisy to his advantage, he shut his mouth. Jack, it bears no resemblance whatsoever. It is clear that no matter how much Romney says, Obama has already played his trump card, no pun intended. This coup de grace is very rare, but it has happened. Similarity? How about an actor and an idealist? Romney is to Reagan as Bozo the Clown is to King Solomon. Not that Reagan should be compared to Solomon, but the gulf between the two is that wide. Carter is to Obama as Frank Beamer is to Vince Lombardi. A narrower, but none the less significant difference. And yes, I would say Obama is as good a President as Lombardi was a coach. I think it has more of a Jefferson-Burr feel. With a slight twist of Goldwater-Johnson. Hold the Muskie. You can't make Romney sound like Reagan even though both last names start with an R and there are no like initials in Carter and Obama. This makes me think Republicans like the letter "R", as in Romney and Ryan, but neither is no Reagan. and Romney is Reagan in the sense that he wants to higher taxes on everyone and raise our debt to 25T. Not even a close comparison. Obama is more visibily active than Carter. Romney doesn't have Reagan's charisma. Carter would have lost to any mainstream republican. Today's GOP has no vocal mainstream. The "far right" of Reagan's time would be called socialists by todays Tea Party. I think the Reagan/Carter comparison might be the wrong one. It's easy to go there because you have an unpopular Democrat in a weak economy being challenged by a Republican from a liberal state. Unfortunately for those who would make that comparison, Romney is no Reagan. What we have here is a case of an unpopular sitting president being taken on by an even less popular candidate. This isn't Reagan vs. Carter. It's Kerry vs. Bush. In 1980 corporations were not "people". As expected from CNN, you presented this question in a very biassed way favoring President Obama. You completely omitted the 16 Trillion $ debt to which he heavily contributed among the fact that he just told the country that he cannot make change "from within", yet from the "Hope and Change" fellow. It is a travesty that the uninformed and uneducated would vote for the guy with the more pleasent personality and smile despite his lack of qualifications. These are the people he preys on, the students 9no experience) and those who are failures. A lot of similarities... The biggest difference this time is the amount of people dependent on government. Too many people expecting their entitlements. Too many people that are okay living on welfare. Too many people that have no incentive to work. Those are the people Obama is banking on to pull him through. Although the Obama and Romney are much different than Carter and Reagan. But the criteria and populations are very different now. Carter and Reagan weren't ever polled on being "likeable", That's todays fluff. Also, the greatest generation was still alive and vibrant. The US was much more conservative than it is now. People had longer attention spans. Carter was barely elected in the first place to get the the taste of Nixon out of our mouths. Reagan and Carter were both males, just like Obama and Romney. Jack you just lost you mind–Reagan is also a useless bum–didn't trickle-down nonsense hurt?? Did he pass any useful legislation??? Obama is wise and competent–you can not compare with predecessor idiots. This is high-tech excellent president–wait 50 years–time will tell. He remains in USA history books. Obama12. President Obama's charisma and popularity may only be effective in a Viva Elvis Rock and Roll Concert, not in a business scenario. Jack, I don't think you can compare the current candidates with 1980. Too much has changed. While I think Romney is a well qualified candidate, he just doesn't seem to be selling his package as well as Obama. I"m a lifelong Republican, but I think Obama will be a tough act to overturn. On the other hand, look at how the Tea Party Republicans handed Ted Cruz a potential senate victory in November against an entrenched candidate named Dewhurst. If that many people are as angry nationwide in November, the pollsters could be badly mistaken. Reagan represents the good old days for republicans. They want control of the white house so bad they will do all sorts of mental gymnastics to convince themselves and the American voters that MIT Romney will bring the same kind of prosperity to the country. MIT Romney would have lost in a primary badly to Regan. If republicans lose the white house this go around they might not get it back till 2024!! Mitt Romney is not as good an actor as Ronald Reagan was and President Obama is a very big celebrity. But none of that should matter. We should all educate ourselves on the issues and the do research that we need to make a decision that benefits The United States of America. Our elections should not be a reality show and the results shouldn't be an awards show. There is no way that Romney can be a Reagan,neither is Obama like Carter,so hold your breath.Despite all the pundits saying this is going to be a close election,mark my words-Obama will win by landslide and a lot of the Tea party and establishment Republicans will lose their seats,including Eric cantor ,Paul Ryan and Michelle Bachman. Jack,I will be expecting you on November 7th, to congratulate me on my accurate prediction. Ancient American Kabuki theater rituals: Those who look to mythic memories for guidance (R) versus those who believe the future can be "managed" with more "fairness"(D). At its core, this election's matchup is pretty much the same as it has been every four years for most of our history. If Mr. Cafferty believes this election will be similar to the landslide victory of Reagan, on this point I'd disagree. It appears to resemble more like Clinton's third term, if our twenty second amendment hadn't limited the Arkansas Governor's term. The Republicans successfully co-ordinate misdirection, but they unfortunately, at least for them, do not always recognize the importance of timing. Clinton's economy had been stellar, albeit with the help of of Greenspan. Now we got all this to blame on one politician? Moving that quickly on their conservative old guard platform, has completely disenfranchised a swing so-called Tea Party vote, who formerly saw an opportunity for themselves to change the way Washington did business, especially in terms of bail-outs for TBTF banks. When this did not happen post-2010 for the GOP middle-class, their swing vote naturally swung to the left in support of the Occupy Wall Street protests. The Republicans could have been in a much more better position this election year, had their legislative agenda been more moderate. Blame poor judgment and timing. As a member of a union, I am more inclined to worry about President Obama's Wall Street leanings, rather than his 2012 re-election problem. This is why I will turn out for Senator Sherrod Brown, whom with a voting record, has always proved he's been a solid FDR Democrat in support of skilled labor. This will be no landslide. It isn’t. Reagan was the great communicator because when he couldn’t spin his hypocrisy to his advantage, he shut his mouth. If you are elderly, poor, a woman, educated, gay, non-Christian–really any minority–and support Romney, you are like a Jew joining the Gistapo: your head is on backwards. Freedom is not limiting opportunities to those who have and telling everyone else what their choices are. Like Reagan, Romney says one thing and does another, like mixing religion with politics. And if his wife can’t take the heat now, she certainly won’t like being in the White House. Obama compared to Carter: With President Obama, America is in better place now then it was the last day we had a republican in the White House. That was not the case with Carter. Romney compared to Reagan: Reagan had a recognizable set of core convictions that he maintained for decades. Mitt Romney is a coreless, two-faced politician who says whatever he believes people want to hear in order to win an election. No comparison between candidates or elections. This is undoubtedly a Republican ploy because they see "Carter" as a weakness. And not coincidentally, Reagan beat Carter. So naturally Republicans would love this notion of a simiarity, of which there is none, to take off. The similarity is the same as any general election- a Democrat vs a Republican. The individuals could not be more different in character. Romney lacks in communication skill what Reagan had. And Obama is not a replica of Carter. The only similarity is that we are at a pivotal moment in time. We can go one way or the other. 2012 feels a lot like 1980 in terms of a sense of change. And uncertainty. Sure, it will be like Carter – only with the Republican ticket losing. Reagan, was an actor simply put; who help pull the plastic sheet over the eyes of the American people. Romney, is a plastic sheet, that the American people can see through. Carter, was a "Human Person, President," unfortunately, the vultures buzzed overhead. Obama, is an intelligent individual, A true American story, but the vultures are still buzzing overhead and on the ground. From day one, the 'Vultures' have been stripping not only Obama but the American working class, day by day. Elimination of the "Vultures," once and for all! Is the only way to save the, U.S.A.!!!! Obama is no Jimmy Carter. He has handled the economy and the MIddle East much better. And when it comes to standing up to the watery attacks of rogue rabbits, I'd trust Obama over Carter any day. Not alike at all, Jack. After 30+ years, the voters are not the same, the campaign laws are not the same, the political parties are not the same and Washington has lost bi-partisianship as well as Statesmanship. We are besiged by lies, videotapes and a flip-flopper to boot! Big money is trying to buy the Presidency and the future of America! Let's face it Jack, Mitt Romney is no Ronald Reagan! When i first read the question/headline, i thought, "yes, that's a stretch." But then i reconsidered - maybe this election could be like the Reagan/Carter election, and President Obama's win will be as large as Reagan's. It's a very tall order to evaluate Reagan as though it were before the 1980 election and you didn't know he would be elected - twice. Jack doesn't even try, so what is the point of this exercise? Romney, like Reagan in 1980, is a "wanna be" at this point. That will soon change, I hope. Romney is a "Patriot conservative" who supported the Vietnam War by going to France and supports the US economy by parking his money in foreign banks. Reagan at least put his acting talents to use making training films while Carter graduated from the Navel Academy and worked on nuclear power for warships. Obama is too young to have lived in the era when military service was a common experience. Most of these people posting here are right you can’t compare Obama with Carter. Carter was an honest, decent, religious man and Obama is a liar, incompetent, racist, hater man. Mr. Carter could have been a good president but he was boycotted at every corner by extreme liberal wing of the party led by Kennedy. The same group that support Obama today. If Reagan would have debated Obama would have destroyed him because Obama without teleprompter is nothing. Obama is damage goods and most of us need to take him to the dumpster, and we need to do it to save our country. They only similarity will be when Mitt tries to interject,"There you go again." That's as close as Romney will ever get to being Reagan. In their despiration, the Republicans have involked nostalgia as a weapon. Obama vs Reagan, since a true Republican Champion has failed to materialize (he's busy out flip-flopping). Carter was not deliberatly ruining our country like Obama's trying to do. In regards to this, and show semblance to being fair, since Obama has been elected, one line being used off and on against him has been he is Jimmy Carter. So, then the question is: If Obama is Carter, what makes Romney Reagan? If people can't be able to show how both are connected, thinking a1980 landslide is possible is sheer folly. Romney is no Reagan. Obama is no Carter. Reagan was very well liked; Romney not so much. Obama does not micro-manage the Executive Branch, wear cardigans, nor preach nonsense like "national malaise" to the electorate. Obama's special forces raids seem to have worked pretty well, Carter's not so much. Reagan was mistaken as an ideologue yet in fact was a traditional center-right moderate Republican who worked reasonably well with his side of the aisle. Romney is not an ideologue, either, but now finds it difficult to gain support from today's GOP, which depends on ideology as a substitute for the Soviets to garner support among folks lower down on the economic ladder. In addition, Romney has alienated his own much further right, social conservative leadership as well as the base of his party by embracing the idea that economic relations, i.e. class relations based on wealth and income, lie at the source of power and politics rather than "values." This is too heretical, because it is too honest, for it reveals the GOP's need to embrace ideologically divisive, religious-based issues such as abortion and right wing hatred of government, per se, to obscure the economic basis of politics and enlist lower class voters to work against their own economic interests. Without a foreign enemy as monolithic as the Soviets, how else can the top percentile attract enough votes to produce enough power? Democrats have essentially appropriated the moderate, centrist, pragmatic positions many Republicans, including Ronald Reagan, used to represent - that's Clintonism. As for Obama, he is not ideological at all, and he represents the Chicago school of pragmatic politics where compromise and political expediency play a central role in doing business. The Dems have backed the GOP folks into their ideological corner, from which the current resulting national stalemate will produce increasing strain and tensions over issues like the debt ceiling (sequestration) that will break the logjam one way or another. I'd bet on Obama's side, but only because he has more pragmatic, realistic independent people willing to work with him and better specific alternatives to solve problems than does Romney. Romney has yet to prove, at least to this voter, he has any other reason for wanting to spend so much of his own money to be president other than to avoid estate taxes. Romney is one of the very wealthy people Theodore Roosevelt spoke about in his New Nationalism speech. So, I may have been born at night, but not last night. Kind of Apples and Oranges. That being said, no other president has been re elected with unemployment this high, except FDR. Romney is no Reagen but Obama is no FDR. People who are out of work, and the number is higher than the unemployment figure, get up early to vote out a sitting president. Carter was a nice man who was out of touch with the harsh realities of being President. hence his order to the SEALS take out the Somali pirates and Bin Laden. Jack i have been around long enough to remember what people were saying about Reagan back then and they were ruthless to say the least. He was painted as an idiot whose wife really ran the show behind the curtain. In truth Reagan was and Romney is a man of integrity. If Romney is elected I think people will be surprised what he accomplishes without making a bunch of excuses. Just like Reagan did. Comparing Reagan and Romney is like comparing jelly beans to car elevators. Except for their hair, they have little in common. As to Obama and Carter, both have won Nobel Prizes only I still don't know why Obama won one so early in his first term and Carter didn't win his until after he was out of office for his humanitarian work. The fiscal crises each dealt with were different, too. Carter had high interest rates which hurt the housing industry and Obama inherited a housing crisis from his predecessor(s) although the GOP hopes and prays that we all forget that. Jack, I remember you anchor Channel 4 New York news with Chuck Scarborough! You were great! A true New Yorker! Well, I also remember the news back then, and I recall the 1980 Reagan-Carter election. This election is nothing like that. The dynamics are different, and the characters too. Obama is not saddled with the baggage Carter dragged around. And Romney doesn't have that winning smile and charisma Regan used so well. No, this is a totally different election in a new time wioth new issues. Not in your lifetime Jack. The country has changed. Americans, not all, are more in tuned with who becomes president and who is elected to a congress that wants a one term president and has done everything possible including signing pledges to lobbyist norquist and rove the everything goes as long as we win. Leave the bodies behind you as you walk in lies. Oh, this is silly. Reagan would have been running against Obama in the primary today, as extreme as the Republicans have shifted away from his ideals. It's like the Boston Tea Party and today's tea party. Enough said. Obama 2012. Hopefully.....YES! "There you go again"! The difference is that Carter was an HONEST man! The difference between Obama and Romney is that Obama is more articulate with his speech....Romney is successful economically. The country is in trouble economically....Obama does not have the economic ability Romney has. We NEED to fix the economy! Different times, Jack. I liked Ronald Reagan but I never thought he was very intelligent. Jimmy Carter, a good man, was in over his head. Pres. Obama inherited 8 years of Republican- thinker George Bush and we were headed for the fiscal cliff. AFter the election, Republican Mitch McConnell clearly stated they would not work with this president and would do everything to make him fail knowing this would mean the county would fail. Every Republican should have hung their heads in shame. Only President Obama's intelligence and clear thinking saved the country from disaster and he was able to do this with a totally defiant House Of Representatives. No president in US history has taken the abuse given to Pres. Obama and I am most proud of his presidency and what he has been able to accomplish. As far as Mitt Romney is concerned, he is a good and decent man but so determined to be president that he has become someone he is not. If the reasonable Mitt, the one that was governor of Mass., was running, I would consider him but he has had to bow down to Gordon Norquist, the Tea Party crazies and the nuts on Fox News to get the nomination and, in doing that, this good man has simply sold his sole.